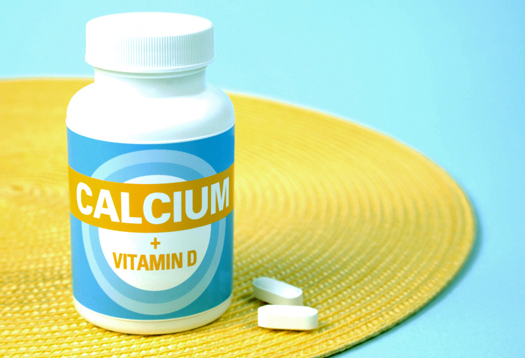 Simply Nutrition NYC | Do Vitamin D and Calcium Supplement Reduce Risk of Bone Fracture? Home • Nutrition • Do Vitamin D and Calcium Supplement Reduce Risk of Bone Fracture? Do Vitamin D and Calcium supplement prevent bone fracture? Vitamin D and calcium are essential nutrients that are important to overall health. Vitamin D helps the body absorb calcium from foods and supplements. It also plays a role in helping muscles, nerves, and the immune system work properly1. Calcium is a mineral that helps maintain strong bones and teeth. The body also needs calcium for muscles, nerves, and blood vessels to work properly, and it plays a role in the release of hormones and enzymes that affect many functions in the body2. Bones are made up of a dense web of protein fibers and calcium. When this web becomes less dense, bones become fragile and break easily. These fractures often lead to pain and disability, less independence, and a reduced quality of life. Why Vitamin D and Calcium supplements may not prevent fractures? A report published last year in BMJ said the risk of fractures later in life is not lowered by a high daily calcium intake3. 61,433 women were followed up for 19 years after a population based cohort in Sweden established in 1987. The hazard ratio for a first hip fracture and the odds ratio for osteoporosis were measured. Researchers found that gradual increases in dietary calcium intake above the first quintile in our female population were not associated with further reductions in fracture risk or osteoporosis. A different report on vitamin D injections showed that they do not reduce the rate of bone fractures suffered by elderly people4. The study is a randomized, double-blind, placebo-controlled trial of 300,000 IU intramuscular (i.m.) vitamin D2 (ergocalciferol) injection or matching placebo every autumn over 3 years. 9440 people (4354 men and 5086 women) aged 75 yrs and over were recruited. They found that injection of 300,000 IU vitamin D2 is not effective in preventing non-vertebral fractures among elderly men and women resident in the general population. More importantly, a study showed that long tern use of calcium can increase an individual’s risk of getting kidney stones5. Gallagher and study lead author Vinod Yalamanchili, M.D., research fellow in Creighton University’s Bone Metabolism Unit, studied 163 healthy, postmenopausal women between the ages of 57 and 85 years. All participants were randomly assigned to receive a vitamin D supplement and their calcium intake was increased from an initial intake of 691 to 1,200-1,400 milligrams per day. They found that approximately 48 participants, or 33 percent, developed high urinary levels of calcium at some time in the study. These participants had 88 episodes of high urinary calcium. Hypercalciuria has been linked to an increased risk of kidney stones identified in previous studies. How can we build stronger bones? To build stronger bones and reduce risk of fractures, the best prevention regime is to get adequate amount of vitamin D and calcium from food sources and perform strengthening exercise. They both cost you less than over-the-counter supplements! In terms of exercise, participating in activities that stress a sequence of muscles and bones in different sites of your body will stimulate bone growth, including Tai Chi, yoga, brisk walking, golf, weight lifting and hiking. Remember it is recommended to get at least 30 minutes of exercise a day for at least 5 times a week to stay fit! 4. Smith H et al. (2007). Effect of annual intramuscular vitamin D on fracture risk in elderly men and women– A population-based, randomized, double-blind, placebo-controlled trial. Rheumatology (Oxford), 46(12):1852-7.